Ugly Sweater Fun Run/Walk Later Today!! News / Ugly Sweater Fun Run/Walk Later Today!! 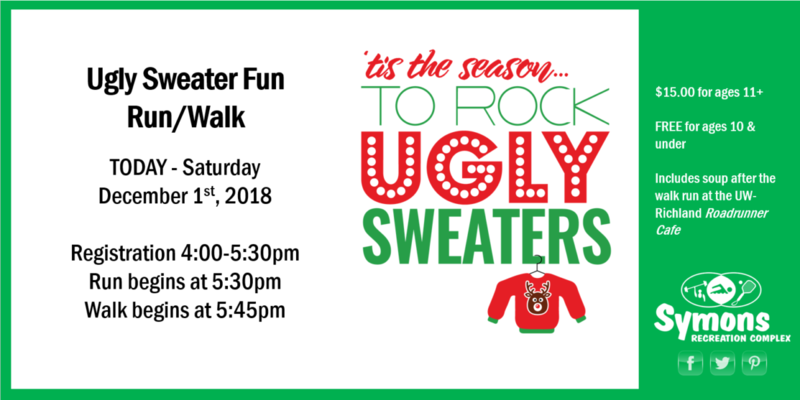 It’s not too late, you can register today online before the event begins at https://symonsrec.com/ugly-sweater-run-walk/ or register in the UW-Richland gymnasium today from 4:00-5:30pm. Two mile Ugly Sweater Fun Run/Walk through the Rotary Lights in the Park! Afterwards, warm up with a warm bowl of soup – your choice of two healthy soups and fixings! Ugly sweaters are not required! It is a great family & friends event!